Pet rabbits are not disposable. Do You Know How Wonderful Pet Rabbits Are? I feel sad when I see people with pet rabbits that keep them in outside cages. They took the time to go out to buy this wonderful pet then they just put them outside away from human contact. I know they feed them, but the bunny rabbits are missing out and so are the owners. Pet rabbits make a wonderful addition to an animal lover’s home. It takes a special person to take care of these animals. If you buy a rabbit and when you get him home you just leave it in a cage, you are missing out on the joys of owning a rabbit. Rabbits are not meant to just sit in a cage all day. They need human contact, love and are to be nurtured. They also need daily exercise. 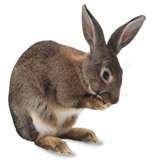 I know a cottontail rabbit is a cute, furry little creature that you just want to pick up and hold. They just beg you to love them. How can you resist their little cotton ball tail, bunny ears, and soft fur? You see them at pet stores and your child wants one. At Easter time, many pet stores are selling baby rabbits. Your child just loves this little creature. So you buy them one for Easter not knowing the responsibilities it takes to care for a rabbit. However, you think it won’t be difficult to keep a house rabbit. They are small; you’ll get a cage to keep them in. Easter comes and goes and your child gets tired of this adorable little rabbit. You get tired of cleaning the cage and taking care of the rabbit. Your child has moved on to other interests, so now you have a pet rabbit that no one pays attention to. What do you do with this little creature? Some people give their rabbits to their local Human Society or worse; they let the poor rabbit go loose outdoors. Domesticated rabbits cannot survive outside on their own. Please do not let your rabbit go outdoors thinking they will be ok as wild rabbits are. They are not wild rabbits. They depend on us to take care of them. To feed them, clean their area and make sure they stay healthy and happy. If you are not willing to do that, then maybe a house rabbit is not for you. At Easter give your child a stuffed bunny rabbit or other rabbit items. But please, do not give them a pet rabbit. They may not be old enough to enjoy how wonderful these animals are. I know they are cute and lovable and when you think of Easter you think of a rabbit. However, a bunny rabbit comes with responsibilities. Ask yourself if you are willing to take on more responsibilities? Families today seem busy enough with work, school, after school activities and family obligations that taking care of a pet that totally depends on you might be too much right now. Maybe when your child gets older and can handle the responsibilities that come with caring for a rabbit, then you can look into getting a house rabbit for them. It would be wonderful if you would adopt one from a Human Society in your area or look on PetFinder.com. These are two wonderful places to look for a perfect house rabbit just waiting for someone to take them home to love them. These are precious little furry friends that somebody decided they did not want. Maybe they were not ready to take on the responsibility of owning a pet rabbit they got at Easter. Pet rabbits are just that – Pets. They are depending on us to take care of them. The rewards you get in return are wonderful. With love and understanding these little creatures will blossom into terrific house pets. Here's other info on house rabbits.